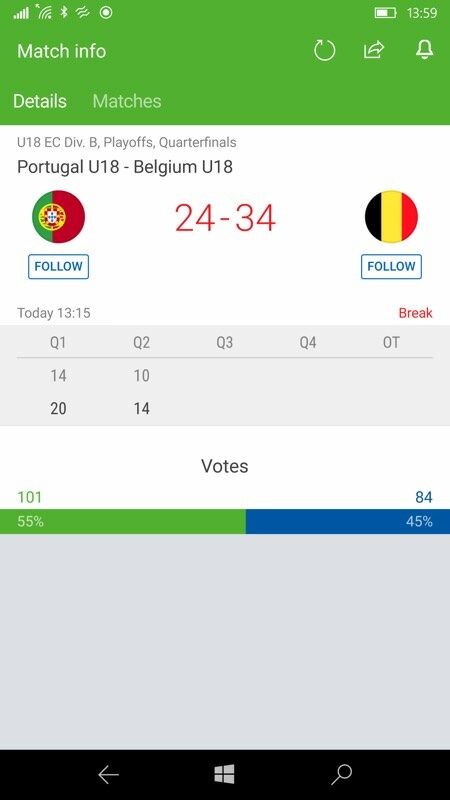 Available for both Windows Phone 8.1 and Windows 10 Mobile, SofaScore LiveScore (UWP, under W10, so runs on tablets and laptops as well) has a full title of 'SofaScore LiveScore - Live Scores and Results', which pretty much sums up what you get. And for a surprisingly wide variety of sports, though football is naturally dominant (for 2018). I've tried to avoid football in the screenshots, as I'm (cough) not really interested in it(!) Plus football has not only not come home, it has stopped for a month. But you'll get the idea from the screenshots below. PLAYER STATISTICS, RATINGS AND HEAT MAPS (for 38 most popular leagues) We use the best sources for football statistics and calculate precise player ratings. Heat-maps (for football) and shoot-maps (in some basketball leagues) visually represent player effort on the field. Find every transfer, player strengths and weaknesses. Manage your fantasy team with ease, or simply have a strong evidence over player’s performance in a season. 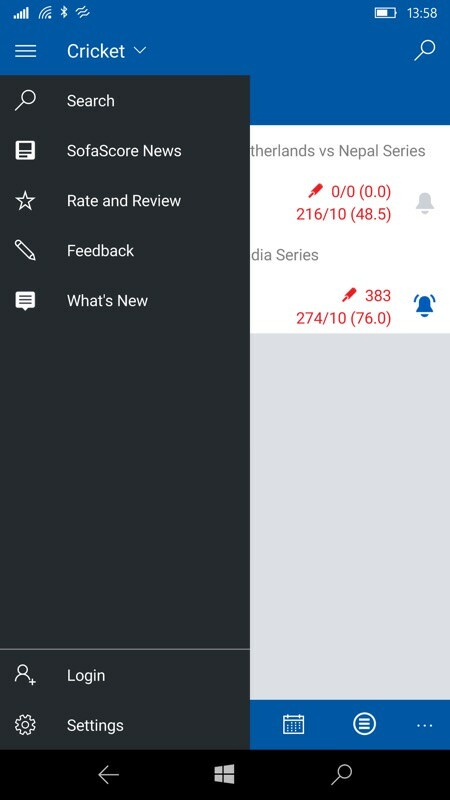 ATTACK MOMENTUM (with unique SofaScore algorithm) AttackMomentum is new and unique way to follow your favorite games live. Using a complex algorithm, we are able to bring you very accurate insight into the course of the game. Once you see our AttackMomentum you’ll ask yourself how could you live without this. FOLLOW EVERYTHING… …and everyone. Everything you can see in the app is available to follow. 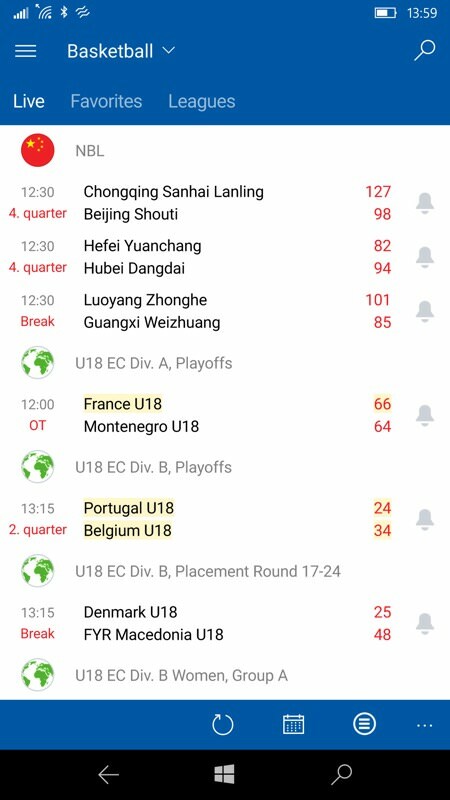 Follow players, teams or even complete leagues and receive fast notifications for every important event. VIDEOS Videos with match highlights, goals and best actions sent in few minutes after they happened. 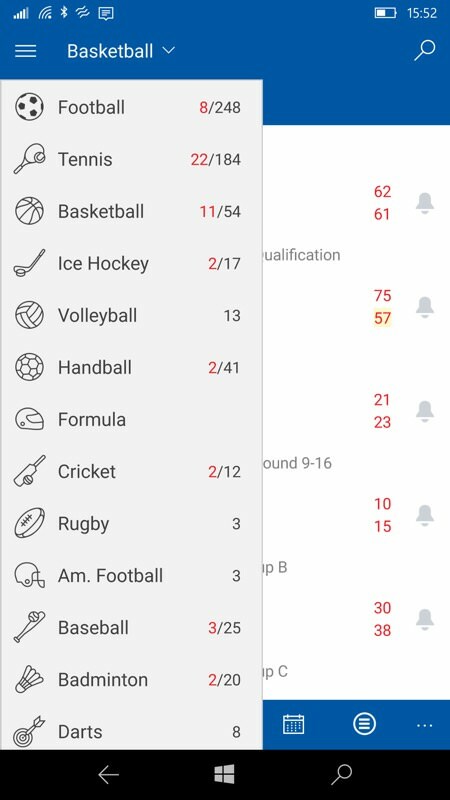 LIVE SCORES FOR 17 SPORTS AND OVER 5000 COMPETITIONS Live, accurate scores and match statistics for Football, Basketball, Tennis, Ice hockey, Volleyball, Handball, Formula 1, Cricket, Rugby, American football, Baseball, Badminton, Darts, Futsal, Waterpolo, Aussie Rules, Snooker). We are constantly improving our coverage, and more sports will be available in the near future. The almost complete list of sports covered (snooker, Aussie rules football, Waterpolo, Futsal, are all below the fold, etc.! ), on a handy pick list. 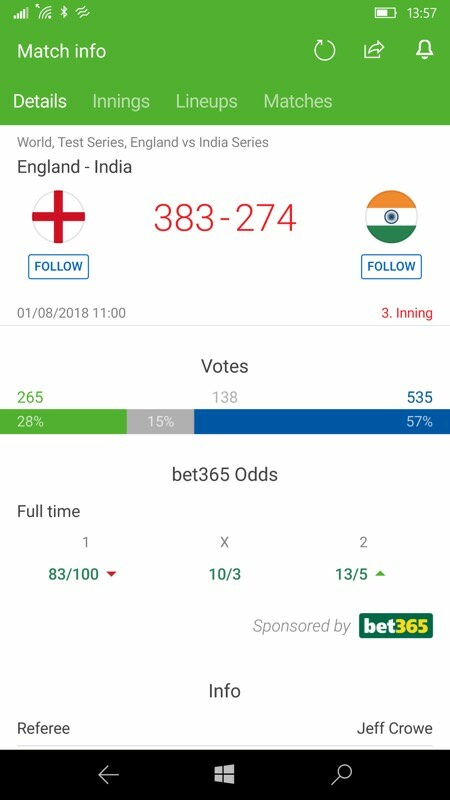 Tap through to see details of England's latest batting collapse! 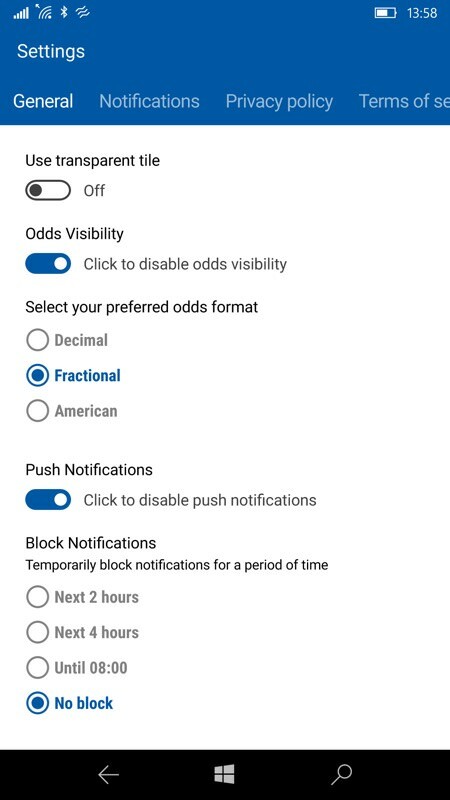 (right) there's not much on the hamburger menu, other than stuff about the app itself, though you can login, which I imagine helps with betting, if you're that way inclined. No dark theme, but there's immense depth in the exact notifications you want on a per-sport basis. The detail, even for obscure sports in obscure countries (sorry China, sorry basketball) is tremendous. If you can bet on it then the details are all here, I think! 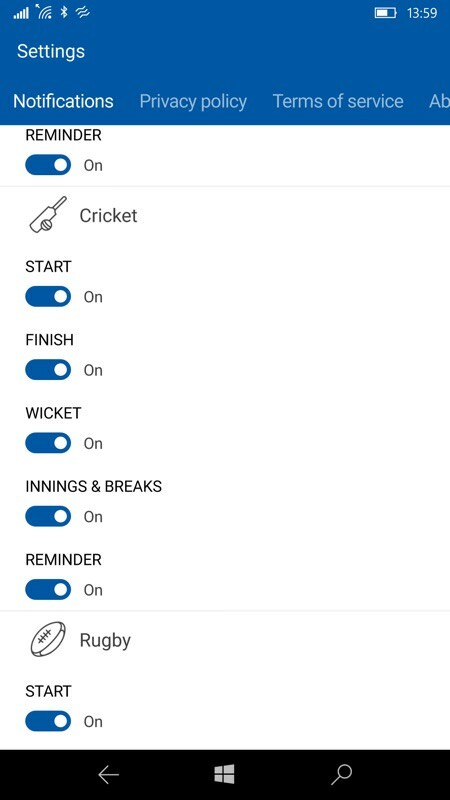 With the facility to follow sports and teams, plus a thousand notifications to tweak, there's a lot here and worth playing with if you're sports mad! You can grab this in the Store here for just about any Windows phone.